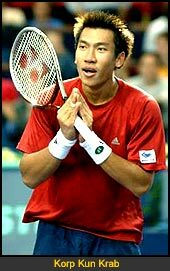 Bangkok, Thailand -- Thailand's Paradorn Srichaphan, Asia's top-ranked tennis player, on Saturday swapped his racket for an alms bowl as he started a seven-day period as a Buddhist monk, local newspapers reported. "I will spend the next seven days as a monk, especially meditating, which is something I can make use of when I return to tennis," Paradorn was quoted saying by The Nation newspaper. Paradorn has adopted the Buddhist name "Mahaviro" which means "great and brave" for his stint as a monk. In a traditional preordination ceremony on Friday, Paradorn had his head shaved prior to donning the monk's saffron-colored robes. He will serve in a temple outside the Thai capital Bangkok. Paradorn, currently ranked No. 43 in the world, has been struggling on the court recently. He's been in two finals but still hasn't won a title this year.